About six months ago we started looking at replacing our aging Cisco 4500 chassis switches that were over 11 years old and starting to show their age with PoE issues, line card failures and numerous bad ports. We had a simple campus network design routing between each IDF with multiple routed links (East/West) back to a pair of Cisco 6509 core switches. In the end we decided to look at Cisco, HPE and Juniper as our top three vendor options. As many readers will recognize I successfully deployed Avaya now Extreme (formerly Nortel) Ethernet switching solutions at my previous employer for 17 years with great success. The Avaya/Extreme product was extremely cost competitive and provided every feature that we needed to provide a highly reliable network infrastructure to a large healthcare provider. So it shouldn’t surprise anyone that I was more than comfortable looking outside of Cisco’s product offerings. In the end we landed on the Juniper EX4300-48P because it met all of our requirements and enabled us make extremely efficient use of our budget. We’ve deployed about 7 IDFs so for (~ 64 switches all total) connected to a pair of Juniper EX4600s via 10GBaseLR SFPs and we have yet to run into any major problems or issues. We did run into a few problems… but those were quickly fixed with a bag of cotton balls and some rubbing alcohol – we had to clean the fiber patches. What did we look at in our selection? Here’s the matrix we ended up creating. If there is some inaccurate information in the table below please post a comment and I’ll be happy to update the data accordingly. I have excluded pricing information, you’ll need to-do your own homework on that front. Since my current employer believes steadfastly in 100% patching in the closet we usually end up with some very large IDFs and so the ability to have 10 switches in a stack was a large consideration. We also have a number of IDFs with very shallow racks and/or cabinets and that necessitated only looking at solutions that were under 17 inches deep. That leaves us with a pair of Juniper EX4600s acting as the campus core running OSPF and connecting to the Juniper EX4300-48Ps in the IDFs in a Virtual Chassis configuration. Each IDF is it’s own L2 domain with OSPF routing between the IDF and the campus core. The Juniper EX4600s in turn connect to the Data Center Cisco 6509s. Next year’s project will be to replace the Cisco 6509s that are still in the Data Center. 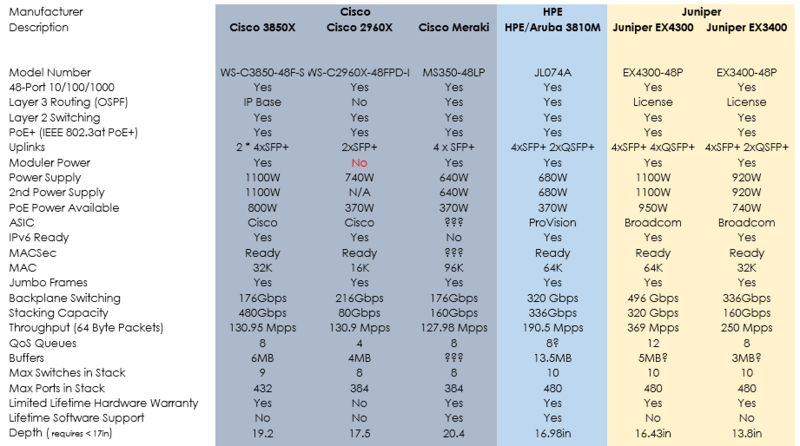 I hope to put out a sample configuration guide in the coming weeks for the Juniper EX4300-48P. Very nice comparison, and great l3 access design, i wonder how come nobody needs to span “just this little vlan” between your IDFs. Also would be interesting how this works out for you medium term, juniper ex is “known” to be very buggy especially the virtual chassis part. No stretched VLANs in this design although it does send the Bonjour folks into mad rages. I’ve yet to see any issues with Virtual Chassis, but I’m only six months into the deployment. I’ve been running virtual chassis for YEARS with few few problems. Pavel, your experience must be with first release gear/code or very old data. Did you consider oversubscription of uplink in the design? I’ve never heard that recommendation from Cisco personally. In any case I’m essentially replacing like for like… we had the same number of ports sometimes less in a Cisco chassis solution with the same uplink bandwidth capacity. I’m designing for a simple office class network. There are no bandwidth killing apps, no PACS systems, no video streaming, no multicast applications… in the past I’ve run 384:2 (192:1) from an over-subscription perspective and it was fine…with 10Gbps uplinks we’re now running at 480:20 (28.8:1). Now if these users were in a photo studio all handling 4K video and RAW picture images then perhaps I’d need to be more thoughtful about the over-subscription but that’s not the case. It’s also good to have legacy utilization graphs from the old network to help gauge the utilization and load. Thanks for sharing the comparison table. This will help and save me a lot of time as we need to replace our core and edge switches in near future. Moreover your blogs on Avaya switching have been very helpful to me. I was wondering if Extreme isn’t in the comparison because of pricing or another reason? Your view on Extreme pricing and features will be highly appreciated. In all honesty there’s a lot of product overlap within Extreme right now. I couldn’t look at them as a long term solution since I have no idea what products are going to make the cut going forward. I was going to ask this same question! It’s too bad to see you move away from SPB as Extreme appears to be leading with that conversation in the campus and branch play! We’re still pushing that portfolio with a lot of customers, but Juniper is always a great solution as well, especially when you get them to compete on price! I would have loved to have seen your comparison on Extreme (SPB) though and see who you would have wound up picking!